Ed. note: This article contains a graphic photo of the dog involved in the incident. Reader discretion is advised. 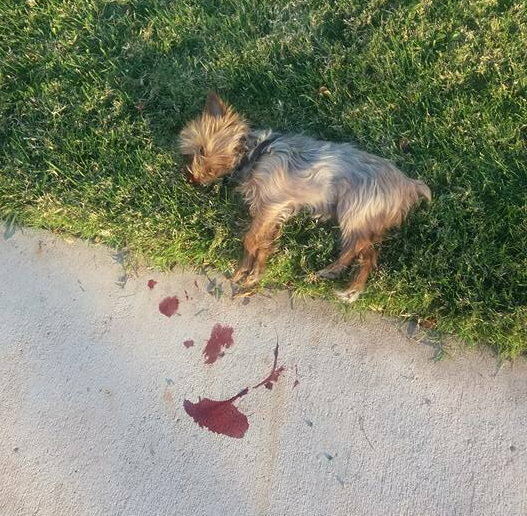 ST. GEORGE — Several residents are questioning the lack of police action involving the death of a Yorkshire Terrier allegedly killed by a neighboring man when the dog wandered into his yard Friday afternoon. St. George Police officers were dispatched to the area of 2040 East in St. George at approximately 4:30 p.m. on report of the dog’s death. The release points out the killing was witnessed by the dog owner’s young daughter, worsening the circumstances of the incident. After an outpouring of support and anger posted to the dog owner’s Facebook page, many people questioned why no action had yet been taken by police. Police said they are still actively investigating the incident. Statements from all parties have been collected, but officers are still trying to acquire any possible witness statements. As the investigation unfolds, enforcement action is actively being considered based on animal cruelty laws. However, determining the mental intent of the suspect at the time of the incident creates complexities for law enforcement, the news release notes. “We must be able to show an intent level to determine what penalties may be imposed if the suspect is convicted. It also impacts what options the officer has when determining whether to cite or arrest a suspect,” the department said in the news release. In the course of the investigation so far, police received conflicting accounts of what the suspect’s intent was when he encountered the dog. Since it didn’t happen in the presence of an officer, any arrest made would have to fall under a narrow set of circumstances to be determined by the prosecutor’s office. “The St. George Police Department does feel that this incident is significant and has had a significant impact on the children and family who own the dog,” the news release assures readers. Ed. ellipsis – Jamie, we have emailed you separately with no reply. We are interested in the information you have but cannot publish it with first discussing with you. I have saved it apart from the comment forum. Please email me directly with contact information so we may talk. Killing the dog may be legal but it was an act of a coward! You said coward ! oh I wasn’t aware this is an article about RealLowlife ! “We are trying to do the RIGHT thing to address this situation.” Ummm, that would involve a pair of pruning shears to the skull. ” We are trying to do the RIGHT thing to address this situation.” Ummm, that would involve a pair of pruning shears to the skull. Duhhhhhhhhhhhh ! Looks like stupid has another day off. Shocker! Get a job, and get off the pills! I agree with your comment 100 % stupid. you need to get a job and get off the pills .you said it stupid ! Yeah Dumbob and RealLowlife could actually pass as husband and wife LOL ! Apparently they aren’t the only one’s. Terrible! I feel bad for the kids they are going to be traumatized for life. Prayers to the family. Amen to that sister ! Seriously, did this idiot think this little bitty dog was a threat to him??? This was an absolutely uncalled for reaction! Not like he was being approached by a large, growling Doberman or Rottweiler that was running at him. Geez!
. This guy should be charged, sent to jail for a long time. Reality much? The most the prosecutors office would have here is property damage. How do you present evidence here? The accused was on his own property. I don’t think they will get anywhere with charges. The prosecutors office has much better things to worry about. The most you have here is a civil case in the lower courts. Maybe $500 but that would be a tough sell. Some jerk kills a small dog on his property and provokes community outrage and 12 comments on the story. The “jerk”deserves some form of consequences. Officer Cody Brotherson is killed last week in the line of duty and his story generated zero comments or apparent interest. Interesting, just saying. Here comes the law against pruning sheets….oh wait! Hillary is not President…carry on. Good thing your grammar is never put to the test. Loser. I agree with your comment 100 % good thing YOUR grammar ain’t never got put to the test eh ? Hey you said it stupid ! I lived in St. George for several years, beautiful city. When I worked in my yard I always had my dog on a chain attached to a stake in the yard. She loved sitting in the yard, and I never let her run loose on the street. I took good care of her, and took her for a walk on a leash every day. One day when I was working in my yard, someone took some shots at my dog with a bee bee gun, just for fun I guess. I could hear shots hitting the driveway near where she was sitting. I am happy that she did not get shot. They lived above me, and had a good view of us from their balcony. Most people don’t have a lot of respect for animals. So the moral of the story is, don’t let your animal run loose in the street, wherever you live. This is very sad, but most people don’t want to deal with animals, especially when they come in their yards. Unfortunately, there are some very nasty and violent people around these days. Well be glad your not living there now with people like RealLowlife and Dumbob socially polluting every where they go. Yeah them 2 are .. ( special ) friends. Terrible thing to happen to a dog. We should be asking why the dog wasn’t restrained—on a leash. Too many pets are killed because of irresponsible owners. Perhaps this dog would still be alive if properly protected. The dog’s owners share some responsibility in this situation. Ed. ellipsis – JC, the email you have included appears to be fictitious. We are interested in the information you have but cannot publish it without first discussing with you. I have saved it apart from the comment forum. Please email me directly with contact information so we may talk. Obviously it’s none of your business stupid ! Why wasn’t this dog on a leash ? Yorkies can be very aggressive…if the man was startled by a dog barking at and trying to maybe bite his leg, and turned and swung his tool at it…well , sorry …TOO BAD !! The dog “approached him” ???? How often do dogs “approach” strangers, in the strangers yard, close enough to get hit.. Unless they are being nasty or aggressive ???? ?